Iceland, the land of fire and ice, is known for its incredible volcanic hot spots, massive glaciers, immense waterfalls, and endless black sand beaches. But, chances are, you already knew that. After all, you may have read about the churches, the parties, and the hot baths within the capital in our 48 Hours in Reykjavík, and you’ve likely read our ultimate road-trip Guide to Iceland’s Ring Road. 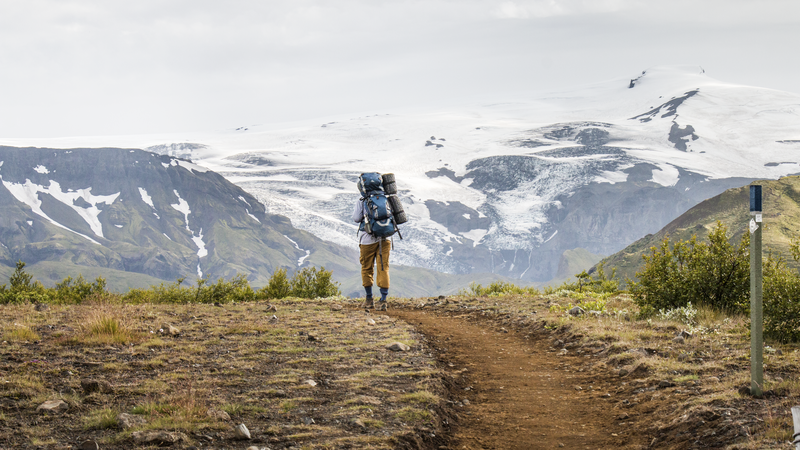 We know you’re here to learn about the sights and hikes that are hard to find anywhere else, too, and that’s why we’ve put together this collection to fuel your adventure desires and take you beyond the general tourist locations of the Golden Circle. We’ll start off on the simpler side of things with some impressive short stops and clean walking paths, but by the end you’ll discover an incredible range of treks and possibilities that outdoor enthusiast of all abilities will enjoy! This 60-meter (197-foot) waterfall in southern Iceland is among the most recognizable in the country. A large cave-like cutout behind the falls was created through erosion and allows visitors to embark on a walking path that circles the thundering water. This hike is only a few hundred meters from the car, but it is a quite memorable staple of the country. Bring waterproof clothes for the heavy mist and a good pair shoes for the slippery rocks. Gljúfrabúi, which means canyon dweller, is a smaller waterfall just a short walk away and is partially hidden in a canyon. This striking volcanic crater protruding from the landscape was formed between 3,000 and 4,000 years ago. It’s located near the southern tip of the Snæfells Peninsula in Snæfellsjökull National Park and rises 109 meters (358 feet) above sea level. A walking path with steps to the summit was constructed to help preserve this precious natural formation. From the top there is excellent visibility of the Snæfellsjökull Glacier to the east and the tip of the peninsula in the North Atlantic to the west. The magma that once spewed from here covers the landscape as far as the eyes can see. 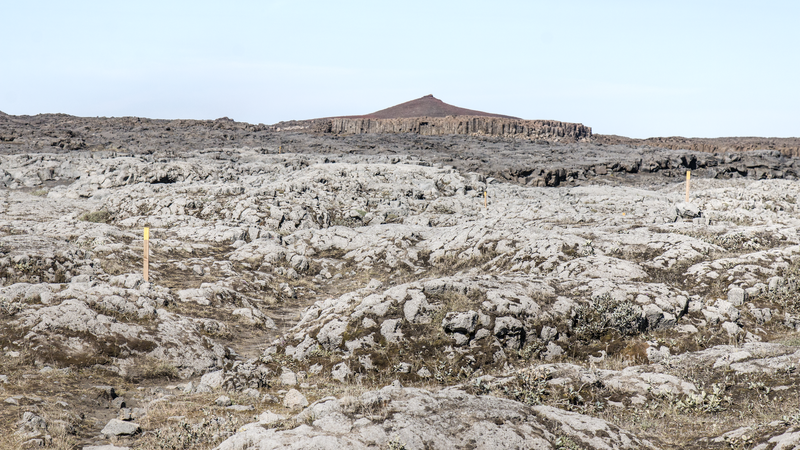 This national monument is another former hot zone comprised of three volcanic craters called Stóra (big) Grábrók, Litla (small) Grábrók, and Grábrókarfell. It is estimated to be over 3,600 years old, and it rises over 100 meters (328 feet) above the landscape. 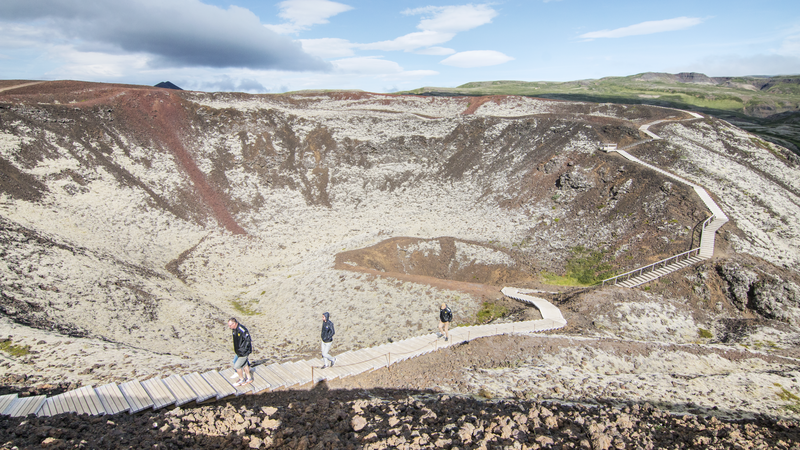 A constructed pathway allows you to get up close to this interesting geology and view the surrounding land from the edge of the former Grábrók Volcano. 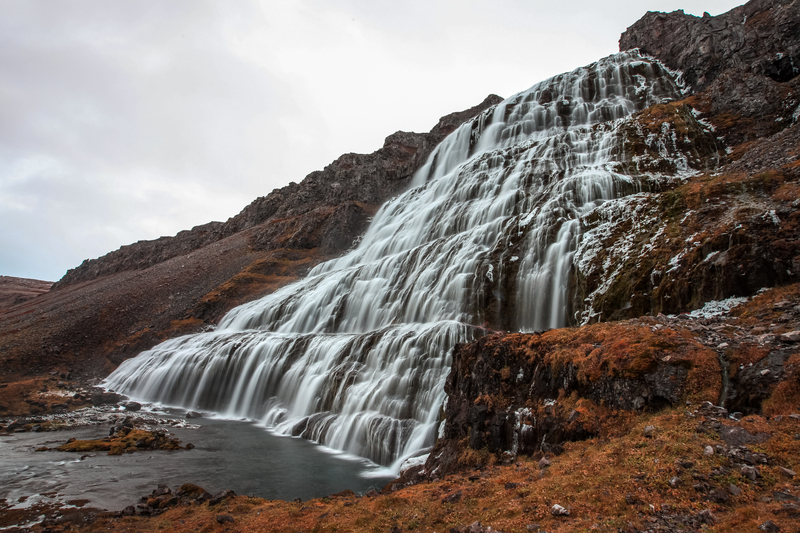 This is another iconic Iceland waterfall located in the country’s Westfjords (Vestfirðir). The main features are a cascading set of drops that total to over 100 meters (328 feet) in height. Water crashes down the mountain in a trapezoidal shape that spans approximately 30 meters (98 feet) wide at the top and widens to about 60 meters (198 feet) at its bottom. A well-defined path leads from the base of the falls up a grand staircase of basalt to the massive upper section of the falls. Just a few kilometers east of Lake Mývatn lies Hverir, a high-temperature geothermal area with steaming fumaroles and bubbling mud pits. The Námafjall Geothermal Field is one of the largest geothermal areas in the country and the most easily accessible. Upon your arrival, you’ll immediately be greeted by the incredibly strong smell of hydrogen sulfide and the hissing of natural gas vents. Námafjall is a high mountain immediately to the west overlooking the field. There is a heated trail to the top, and many visitors choose to climb to the summit for its spectacular views of the region. From the peak, you can enjoy the incredible landscape variety of the Diamond Circle. A series of trails connect to this point, so you can extend your adventure. One of them crosses Route 1 to the Námaskarð Pass and continues to the north. This natural fissure on the Snæfellsnes Peninsula extends inside Mount Botnsfjall and is overwhelmed with a glacial melt stream. From the parking area, a marked trail climbs 125 meters (410 feet) over 0.5 kilometers (0.3 miles) up a valley to a minor waterfall and a narrow passage that leads inside the mountain. Inside, the space widens into a majestic grotto covered from the ground to the sky in a bright green moss. Overhead the canyon lets in a window of light giving the walls and floor a mysterious glisten. The gorge continues for several kilometers, and you are welcome to continue your exploration at your own risk. You will probably need waterproof shoes and clothing because the path may have several inches of water and there are continuous drips from overhead. Located in the eastern region of Iceland just outside of Egilsstaðir, these waterfalls flow over a unique and incredible array of geological formations formed during the origins of the island. A there-and-back trek begins near a bridge across the Lagarfljót River and climbs approximately 250 meters (820 feet) over 3 kilometers (1.86 miles) along the Hengifossá River to one of the highest waterfalls in Iceland. Litlanesfoss will appear before you with magnificent vertical basalt columns. Following an eruption, lava hardens and cools, creating hexagonal columns perpendicular to the surface. Hengifoss is surrounded by a series of red-orange layers of clay that are separated by hardened basalt from various volcanic eruptions. These horizontal lines are so striking that they can be seen all the way from the parking area. Dettifoss, in the northeastern Diamond Circle, is nicknamed tumble falls. Spanning over 100 meters (328 feet) wide and dropping over 45 meters (148 feet) into a canyon, it is the largest waterfall in Iceland and the most powerful in all of Europe. A 6-kilometer (3.75-mile) hiking path forms a circuit route from Selfoss to Dettifoss and to the rock walls of Sanddular. From the viewing platforms, this path takes you along the high plateau edge of the canyon and over large basalt columns to the west. There is rocky terrain, sand hills, and a section that requires bit of climbing, so be prepared to experience the rough landscape. 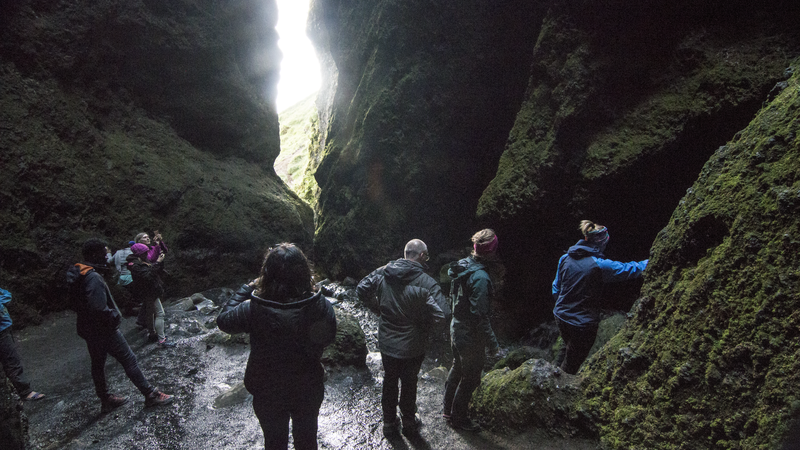 Within a short distance you’ll be isolated from the large crowds and immersed in a series of plateaus and canyons of Jökulsárglúfur that reflect the violent washout and former river trajectories of the last Ice Age. This small town on the east coast of Iceland is well known for its old wooden buildings and remnants of urban street configurations. 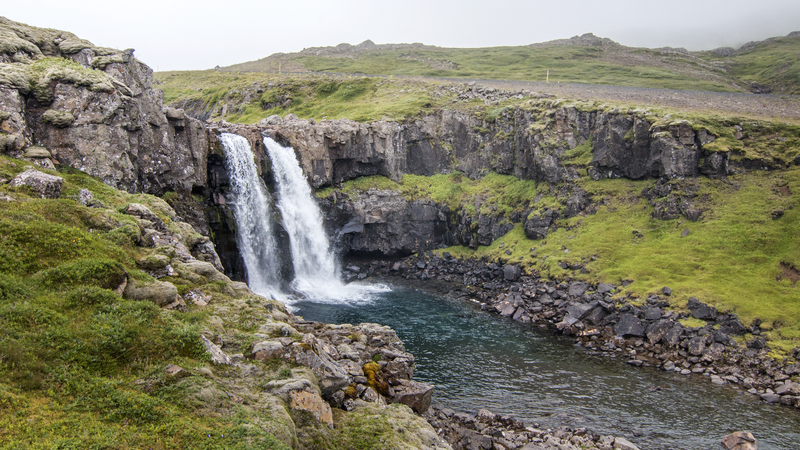 An incredible hiking path begins in the Neðri-Stafur cliffs a follows the water down a series of cascading waterfalls surrounded by high cliffs. Even more magnificent are the dozens of additional waterfalls pouring down the steep valley walls far above you on either side of the valley. While you may get your feet wet, this is certainly one of the most serene and calming hiking paths in the county. This hike can be completed as a there-and-back adventure, but many trekkers choose to start at the top of the valley off of the Stafirnir Road at approximately 350 meters (1,150 feet) and make a one-way descent all the way to the Blue Church at the mouth of the fjord. 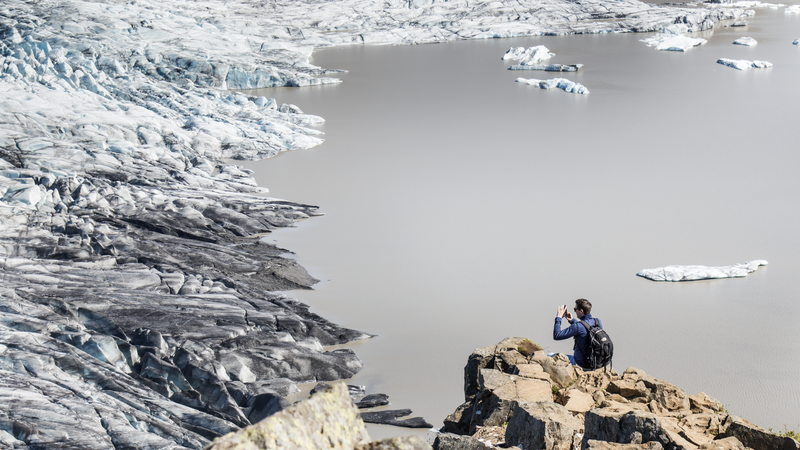 Vatnajökull National Park is the southeastern section of the country and is home to an incredible variety of landscape features created by the combined forces of rivers, glacial ice, and volcanic and geothermal activity. As the largest national park in Western Europe, this park is huge! In fact, it takes up over 13% of Iceland. 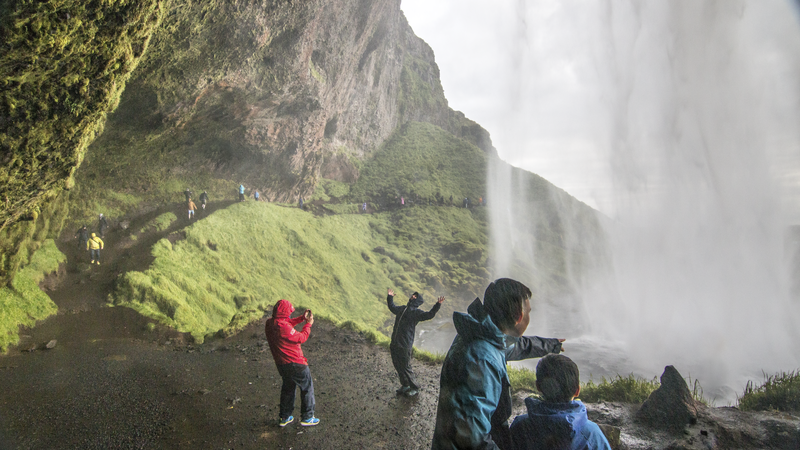 From the visitor center off of the Ring Road, an 8-kilometer (5-mile) path takes you up 390 meters (1,280 feet) to Svartifoss, or Black Falls, and circles across a high overlook above the glacier Skaftafellsjokull and its lagoon. If you are only interested in seeing the large black basaltic columns surrounding the waterfall, the route type is there-and-back and with an elevation gain of 120 meters (393 feet) and a round-trip distance of 2.4 kilometers (1.5 miles). This double-peaked 1,213-meter (3,753-foot) mountain towers over the suburbs of Akureyri. Most of the mountains here were formed by layers of lava 5 to 10 million years ago. The surrounding landscape is covered with thick moss and leads across beautiful stream beds. 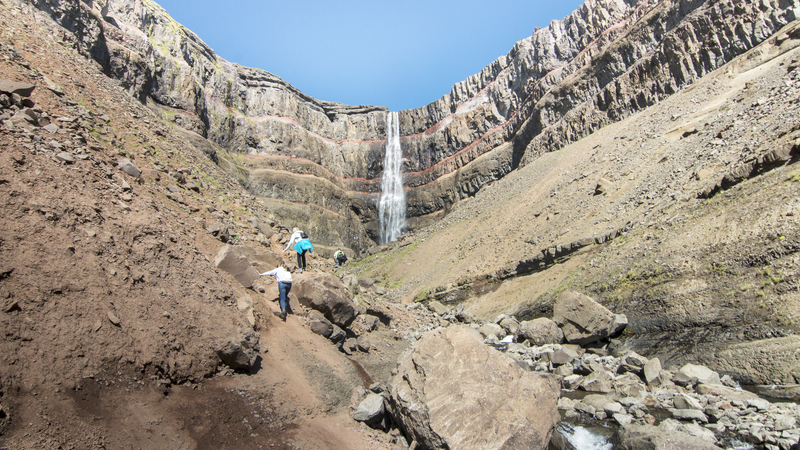 A hike up Súlur offers a rewarding 800-meter (2,625-foot), 11-kilometer (7-mile) there-and-back climb with incredible views over the city and out to Eyjafjörður, the longest fjord in Iceland. The rocky tops of these mountains are covered by snow throughout the year, and trekkers should be aware that the weather conditions can change suddenly to storms and blizzards. 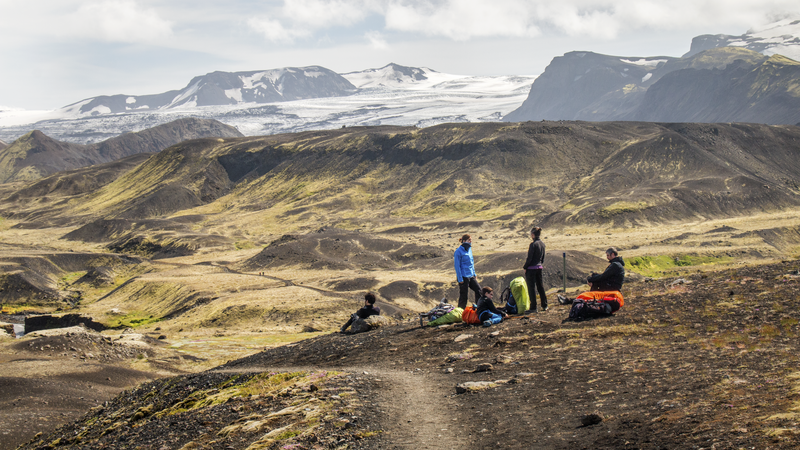 The Laugavegur is one of the most beautiful and awe-inspiring treks in all of Iceland. It is so renowned that it has been rated by National Geographic as one of the best hikes in the world. This adventure is a 54-kilometer (34-mile) one-way route that begins in the hardened lava fields of Landmannalaugar and ends in the glacial valley of Þórsmörk. It is typically completed over two to four days with potential overnights in Hrafntinnusker, Álftavatn, Hvanngil, and Emstrur. Throughout the trek you will experience a grand spectrum of landscapes that include red rhyolite mountains, vibrant turquoise sands, bubbling thermal vents, neon green mosses, glistening white glaciers, hardened volcanic spew, cold river flows, and eroded gravel floodplains. Landmannalaugar is the starting point at the heart of the Fjallbak Nature Reserve, an area home to volcanoes, hot spots, lakes, rivers, and a variety of vegetation. The ending is in Þórsmörk next to Krossá, a wide river, and large floral mountains beneath Eyjafjallajökull. 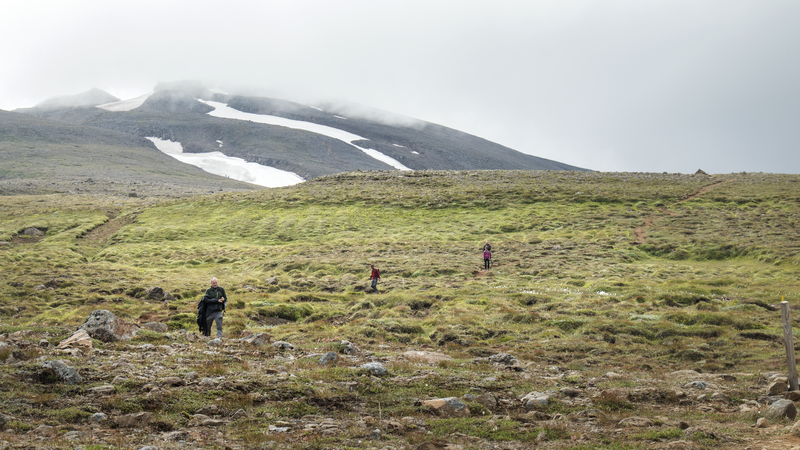 Many trekkers continue onto Fimmvörðuháls, a 29 kilometers (18 miles) trail, which connects Þórsmörk to Skógar. 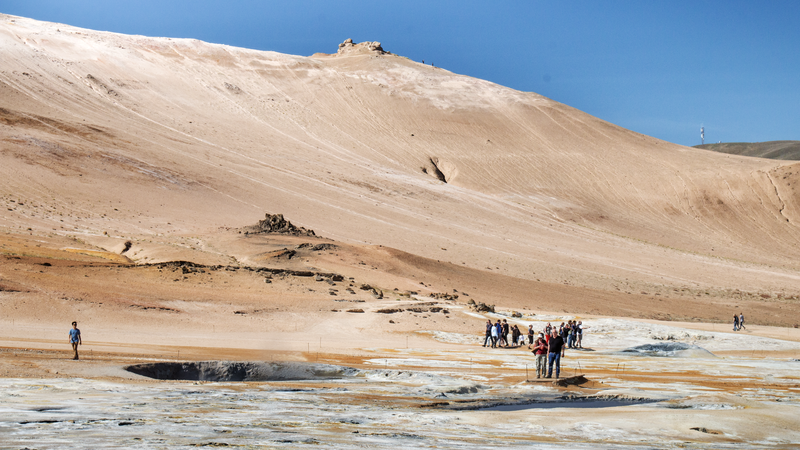 The entire terrain is a dream for volcanologists and geological enthusiasts who want to experience a raw and untouched landscape scourged and molded over millennia of explosive activity! 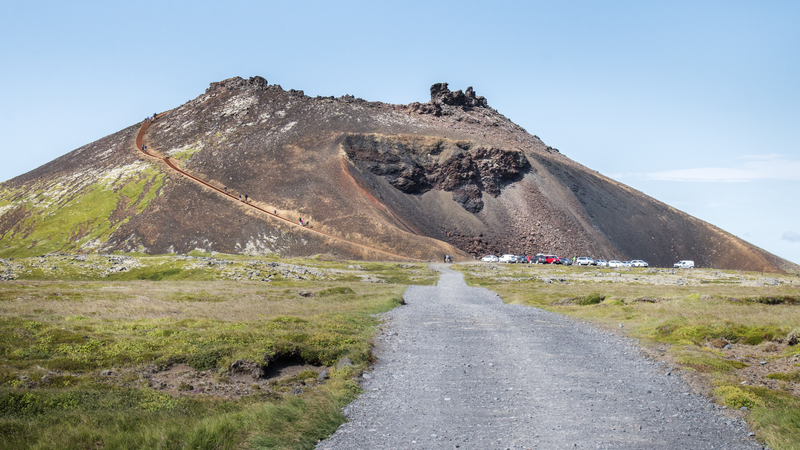 The most economical means of transport is the Reykjavík Excursions Hikers’ Pass, which offers a discounted round-trip four-wheel drive bus ride to and from any combination of the aforementioned campsites and the BSI Terminal in Reykjavík. From easy day walks to weathered mountains in the highlands, this adventure collection will undoubtedly keep you entertained and begging for more! We know that our community can really tack on the miles, but when it's time to chill out and rest our feet, we know how to do that pretty well too. That's why you need to check out Iceland's Must-Do Hot Springs to rejuvenate your body in the classic Outdoor Project way! Be prepared for anything while exploring this beautiful and unforgiving landscape. Check here for additional Iceland adventures, and stay safe out there!